Affordable ENT viewing and diagnostic device. ENTraview a telemedicine enabled Otoscope was developed by IcarusNova and a surgeon at St. John’s. IcarusNova subsequently acquired the patent. 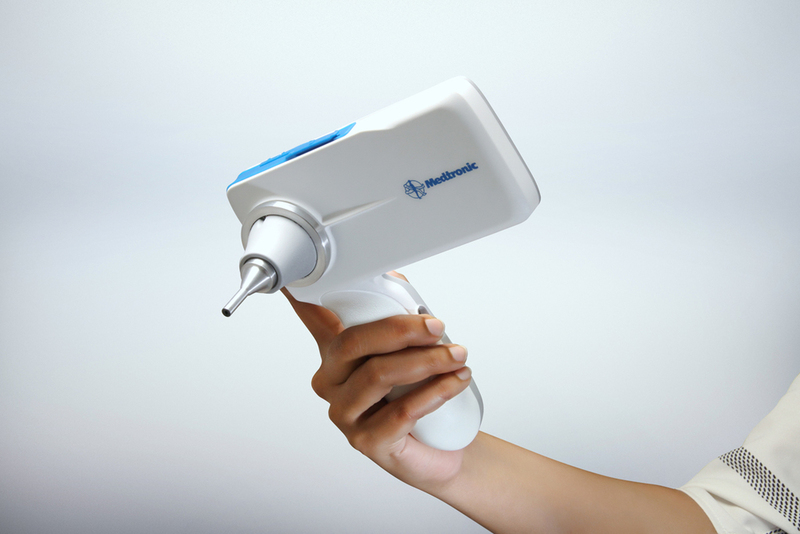 Medtronic field tested the concept for its Ear Health program Shruti against other competing ideas and found that it best suited their requirements. This led to Medtronic acquiring the patent from IcarusNova. Subsequently IcarusNova developed the ENTraview prototype into a market ready product for Medtronic. The Project goals were to deliver comparable performance to the Prototype but at much lower costs. IcarusNova along with other partners delivered a CE certified product within a highly efficient time frame and developmental cost. From our extensive understanding of testing the prototype in field conditions and feedback from stakeholders we derived Product and User Specifications for development. Working with a Netherlands based Optic Design partner for Optic design to create a new configuration for low cost but comparable optic performance to an endoscope. The “thick lens” design is a fine combination of optical performance for very compact package dimensions (Less than 2mm Diameter) for insertion into the ear canal. Using available, off the shelf optic fibres we developed an illumination configuration to maximise light throughput. Subsequently working with a fiber optic partner in India we created a process for mass manufacture of these fiber bundles for the ENRtraview. This involved several process routines which were completely new for both the vendor as well as us. IcarusNova designed and developed all the precision engineered mechanical components with a fine machining vendor. The resulting parts are highly optimised for error free assembly and mass production. The dimensional tolerances were highly challenging because of the sensitivity of the optical design. Interacting with China manufacturers to choose a mobile phone OEM who would be able to meet our standards of product performance, supply, and support. Along with Medtronic IcarusNova evaluated the often confusing landscape ofChina based mobile OEM’s to zero in on a partner and a platform which would work for the program in the long-term. We developed custom Android software to create a flexible interface between the Optics and the mobile phone platform. This was necessary as there were several unpredictable factors in both cases which meant customisation of each device at assembly. The software consisted of an image capture component and a calibration component. Working from grounds up IcarusNova designed and developed the power electronics necessary for charging both the mobile platform as well as the illumination circuit. In tandem the mechanical engineering team iterated the enclosure design to achieve a fine balance between compactness, ergonomics, aesthetic design and safe insertion into patient ears. Several rounds of prototyping and testing gave the team an assurance of viability of the design for IP22 specifications. In line with Medtronics stringent specifications all materials used are bio compatible. All components of the ENTtaview require their own specialised methods of prototyping, working with vendors both in India and in the Netherlands, we prototyped all elements through several cycles to visualise performance and fine tune for mass production. Along with Medtronic we helped shortlist the contract manufacturer who would finally take on the responsibility of mass manufacture. The global contract manufacturer Sanmina was chosen to be the manufacturing partner for ENTraview. With a vendor Icarus designed and developed all the test jigs at every stage of manufacture to ensure that the ENTraview components were tested at every level of manufacture for continuous quality control during manufacture.